The Israeli soldier is the second Israeli to die in the fighting, while 260 Palestinians have been killed. 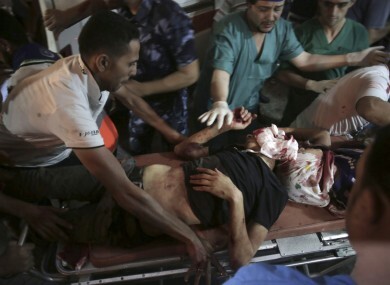 Medics wheel two wounded Palestinians into the emergency room of Shifa hospital in Gaza City. THE PALESTINIAN DEATH toll in Gaza hit 260 overnight as Israel pressed a ground offensive on the 11th day of a large-scale operation to stamp out militant rocket fire. Israel’s toll in the violence meanwhile rose to two with the death of a soldier in Gaza, the army said. The latest Palestinian deaths were of two men from the Shami family at Khan Yunis in southern Gaza, emergency services spokesman Ashraf al-Qudra said. The deaths raised the toll today to 19. Earlier, four family members in Khan Yunis were killed, with another two slain in the northern town Beit Hanoun. And before that, three men were killed by tank fire east of Khan Yunis and another was killed in Shejaiyeh, east of Gaza City, Qudra said. Five people were killed by Israeli fire in separate attacks on the southern city of Rafah, including a five-month-old baby. In northern Gaza, tank shelling killed two men were killed not long after midnight in Beit Hanun, the spokesman said. According to figures provided by the Gaza-based Palestinian Centre for Human Rights, more than 80 percent of the victims have been civilians. At least 1,920 Palestinians have also been wounded. Since the Israeli operation began before dawn on July 8, at least 1,150 rockets fired from Gaza have struck Israel, and another 311 have been shot down by the Iron Dome air defence system, army figures show. On the Israeli side, one civilian was killed by rocket fire this week, and an Israeli soldier was killed in Gaza on Friday. Another four Israelis have been seriously injured. Email “19, including Israeli soldier, killed in Gaza overnight”. Feedback on “19, including Israeli soldier, killed in Gaza overnight”.